Rob and Diane are part of the first generation of Lindy Hoppers and Jazz dancers like Ryan Francois, Steven Mitchell, Chester Whitmore and the Rhythm Hot Shots who choreographed, promoted, produced, presented and taught world wide starting in the early 1990’s. Starting to Lindy Hop with Jonathan and Sylvia in Santa Barbara, Rob learned the original Al Minns and Frankie Manning style Lindy with Steven Mitchell in 1986, which led to meeting the legendary Frankie Manning that same year. 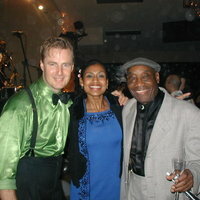 Besides studying with the original Lindy, Shag and Balboa dancers in LA and working with Norma Miller in Las Vegas and Chester Whitmore in LA, in 1991 it was time to connect with other Lindy Hoppers in Europe. Soon after that, Diane and Rob started teaching extensively on the European and world circuit and taught at the amazing Herräng Dance Camp in Sweden for over 18 years. Diane performed with the Rhythm Hot Shots from Sweden on their American Tour. They built a special bond with Frankie Manning, Norma Miller and Chazz Young and other teachers, working side-by-side at many events around the world. Rob and Diane are known for being easy going, approachable and fun teachers who get dancers to do amazing stuff quickly. They have earned a reputation internationally with many of the dancers that are teachers today. Rob and Diane were instrumental in building the San Francisco Bay Area Swing dance scene in the late 90’s and building an amazing following with their weekly club nights in different parts of town from San Francisco to San Jose, with attendance of over 300 people a night, being able to hire bands and inspiring other teachers to follow their example. After living in California they are now in Texas where they teach between Austin and San Antonio. Meet them at the next workshop or class and see how their passion is so contagious; they are there to inspire you!